Late last month, a Seattle Public Library custodian was rushed to a hospital after being stuck with a needle while cleaning out a trash can in the women’s restroom at SPL’s Ballard branch. The needle was tucked inside a sanitary napkin container, with the point facing out, according to Seattle Public Libraries spokeswoman Andra Addison. Addison says this is the first time she’s aware of that a library employee has been pricked by a needle at any of the branches. The opioid epidemic has led to a dramatic, highly visible uptick in public drug use in the city, including on city-owned property such as parks and public libraries. But despite rising rates of opiate use and overdose deaths (219 of a record 332 drug-use deaths in King County in 2016 were opioid-related), the Seattle library system does not allow sharps containers—sealed medical-waste bins to discard used needles—in any of its public restrooms. Instead of offering public sharps containers, the library trains its staffers on how to dispose of needles when they come across them, and provides extra-thick gloves, blue “pinchers” (to pick up the needles), and small plastic containers for sharps disposal. Addison says there’s a simple reason that the library doesn’t provide sharps containers for drug users: “We don’t allow illegal drug use in the library. 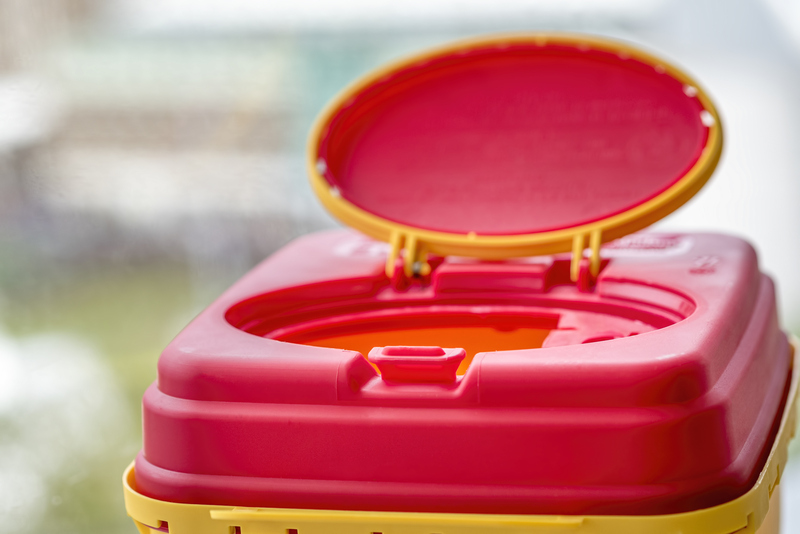 It’s against our rules of conduct.” Providing sharps containers would be a tacit acknowledgement that people are using drugs at the library in violation of those rules. But other libraries, both across the country and right here in King County, have taken a different approach. The King County Public Library system has sharps containers branches in Burien, Renton, and Bellevue, locations where library staffers reported finding needles on bathroom floors and flushed down toilets. As Munn sees it, providing safe places for people to dispose of their needles so that other people don’t get exposed to drugs or communicable diseases is a public-safety measure, not an endorsement of illegal drug use. Since last year, a Seattle Public Utilities pilot program has made sharps containers available at a handful of locations (including three park restrooms) around the city. According to Julie Moore, a spokeswoman for the city’s department of Finance and Administrative Services, there are no sharps containers in other publicly accessible city buildings managed by FAS, including City Hall, the Seattle Municipal Tower, or fire or police stations. Addison says the library’s administrative services division (which sets policies for library buildings, such as whether they will offer sharps containers), discussed providing sharps containers at one point, but determined that “we just really don’t have the need for it.” However, she adds, “the world is changing,” and “it’s not something we wouldn’t consider” if the need arose. Advocates say Seattle is already far past that point. “We hear from librarians all the time, because [drug use] happens in libraries, so it is disappointing that there are not more proactive resources available,” says Patricia Sully, the coordinator for the drug policy group VOCAL-WA. Both Sully and a representative from REACH, a street outreach group that works with homeless people struggling with addiction, were surprised to learn that the library has a policy prohibiting sharps containers. “We’re not nearly as far along as we thought,” Sully says.